1. Hi Gerald. How and when did you get started in wildlife photography? 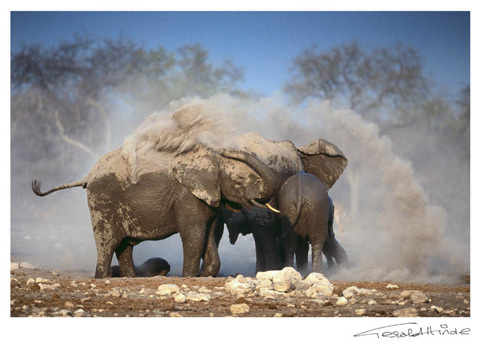 As a family we went to the Kruger National Park every July school holiday from when I was 9 years of age. I had a Brownie camera (age give-away) which I tried desperately to master – not the technology, but how to look down into the mirror view finder and find the animals! 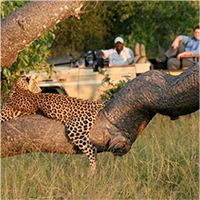 We had really good times in Kruger and my interest in wildlife grew yearly. In the early 50’s there were of course no tar roads and very few cars were dust-proof which resulted in many attempts to stuff paper into the places where the dust came in. Most of the dust pored in between the door rubbers hence newspaper stuffing along most doors. Anyway this never deterred us and I often recall the memories and really amazing sightings we saw which mostly involved the lions, along the Sabie River road, and there daylight hunting as the animals came down for there morning drink. My dad later invested in a 8mm cine camera and later a 16mm. Both had limited capabilities, especially the hand winding which had to be done repeatedly, and the 16mm Pallard Bolex camera with the three lenses that had to be hand rotated. My dad made a few movies for which he won awards at the local “Cine Club” in Springs and he later gave me the 16mm camera when he lost interest. I continued taking photographs while running two branches of the Pat Hinde Motor Group and produced my first book (self published) in 1989. In my complete ignorance of the market I printed 12,000 copies of “Gamedrive” when the market could maybe have taken 4,000. With some aggressive marketing and over time I eventually sold 11,500 copies. In October 1989 we sold the motor group and that released me to follow my passion. 2. People like to talk about 'lucky breaks' but I think it's more practice and passion that leads to a breakthrough to becoming a professional photographer. When was your breakthrough? During my time in the motor business I was focusing most of my attention on a certain female leopard in the Sabie Sand area. After some heart aches at attempting to continue my focus and complete a book about this very special leopard I was fortunate enough, through the kindness of Mala Mala Game Reserve, to spend some nine months on the property allowing me to complete my project. From the motor business to the bush so quickly and I will forever be thankful to Michael Rattray. He was almost solely responsible for my “lucky break”. 3. 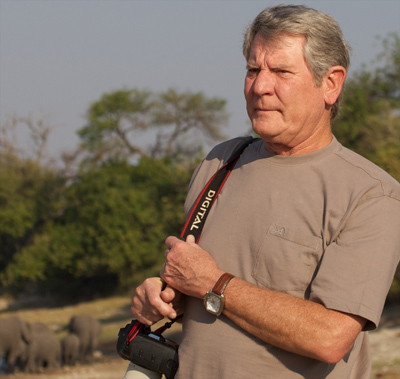 Before compiling the questions to this interview I went to find which book of yours I had in my library - I found a few, either written by you or co-authored; The Original Game drive, An African Experience, Leopard and Catching the Moment. Are these books still in print? None of these books are still in print but my latest books “Game Parks of South Africa” and ‘The very best of African Wildlife” are still presently available on the market. I have produced 11 books and 3 wildlife documentaries over the 22 years. 4. 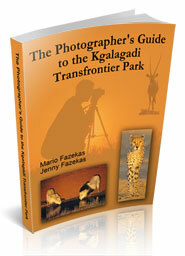 Your photographs in these books have been taken in most of the famous southern and east African game reserves. Having photographed in so many wilderness areas do you have any favorite places or locations that keep drawing you back? It's amazing how things tend to change from area to area as the years go by. I suppose it has a lot to do with climate and human influence. The most important being the human influence side of things. For instance when areas get more popular the tourist pressure makes it difficult to relax and spend the necessary time in solitude with animals to produce really fine photography. I do tend to go back to Botswana and Kenya whenever possible. We do however have wonderful places right here on our doorstep. 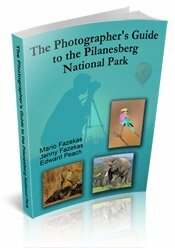 I for one was pushed into visiting most of the National Parks in South Africa when I did the photography for “ Game Parks of South Africa”. Something which I’m ashamed to admit but never the less a good lesson I got to know most of the very special Game Parks right here on our doorstep. 5. 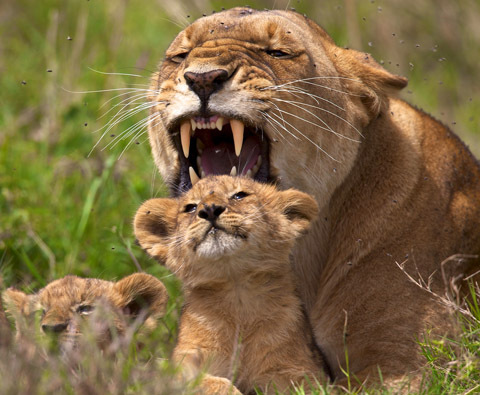 I see on your blog that you recently spent a few days in the Kruger Park and the Kgalagadi. 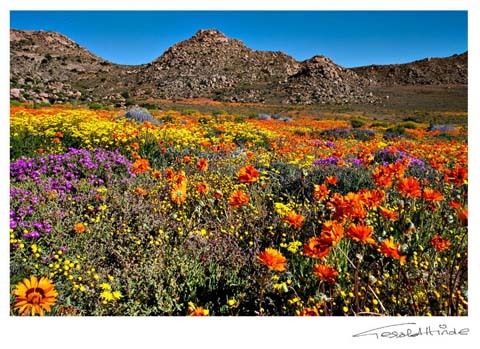 Most of our visitors are primarily interested in the self-drive parks of Kruger and Kgalagadi so I would like to ask you some questions based on these two national parks: 5.a. 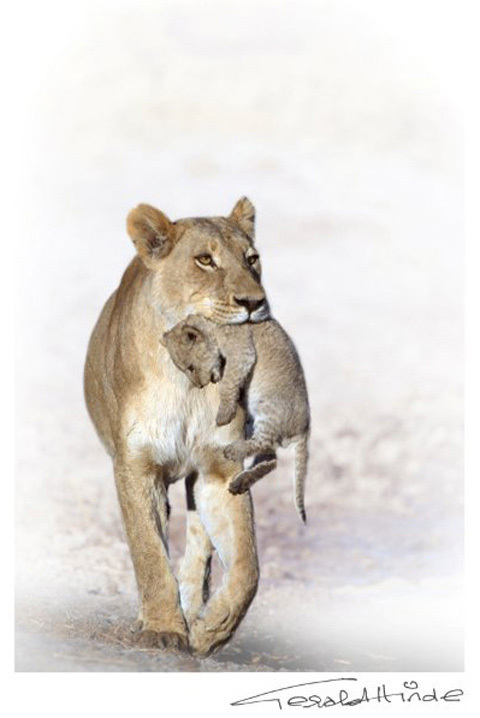 Do you have and favorite spots / waterholes to photograph in the Kruger & Kgalagadi? 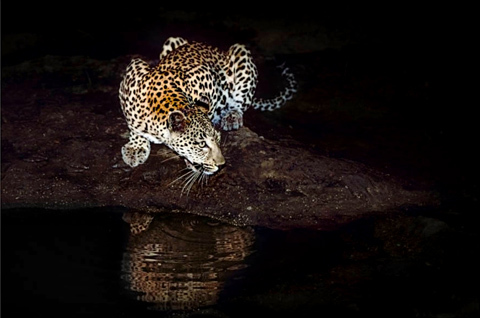 It is really difficult to pin point areas in specific because of seasonal changes and of course the closing down of so many unnatural waterholes in Kruger. Not that I think the closing down of these waterholes wasn’t necessary but I had some really good sightings at places like Munshe dam where I did a lot of filming for my first documentary “Royal Blood” This was a movie about a pride of lions in Kruger and another in Savute in Botswana. I do have a really favorite little spot in Kruger though – Biyamiti causeway. In the Kgalagadi I particularly enjoy the area (and waterholes) between Mata Mata and Urikaruus wilderness camp in the south. 5.b. 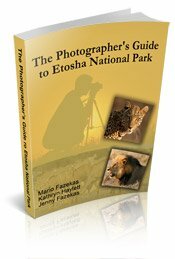 Does photography in these two very different parks provide any unique challenges for photographers? Not really different to most National Parks that require longer telephoto lens and getting out and about early morning and later afternoon for good lighting. 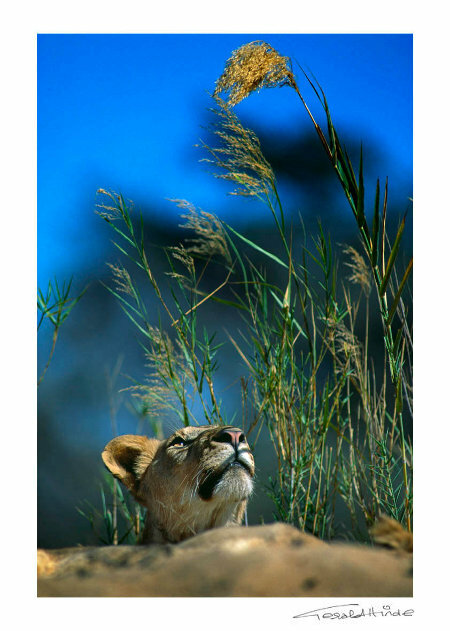 The Kgalagadi offers some great opportunities for dramatic scenic photography. 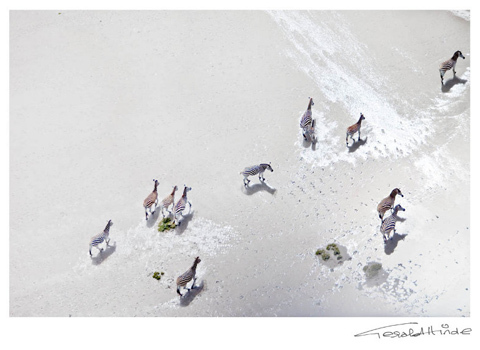 With scenic photography it’s a good idea to try and include some animals even if they appear small in the image. 5.c. 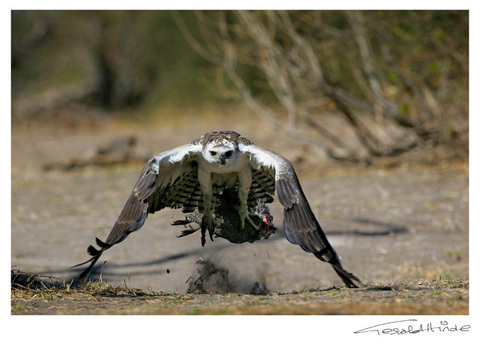 Before you go out on a photo safari each day have you planned your route and what animal/s you are wanting to shoot? Depending on the assignment that I may be working on, but generally speaking I do prepare a route. The important part of this planning is to get to the right areas at the time that the lighting is at its best. Also some waterholes are better in the morning or afternoon depending on where one is allowed to park and the direction of the sun. 5.d. Do you make use of the sighting boards and sighting books at these parks to locate animals? I do have a look as a matter of interest but tend to stay away from areas where a lot of traffic would be encountered. Too many cars - drive on – that’s what I usually do. 5.e. What would be your top photographic tips for photographers visiting these two parks? •	It is most important to understand your camera and lenses so get some practice before you go. If all else fails read the instruction manual - something we should all do! •	Use a beanbag (my preference) or window mount for pin sharp pictures. •	Be patient and wait for the right moment to take the shot. Behavioral pictures are the most interesting. Get the lighting right. •	Focus on the eyes and give the animals space to walk or look into. Also remember the rule of two thirds. Divide your image into thirds with grid lines and place the animal where the lines intersect. 6. In 'The Original Game drive' you have quite a few pages on Etosha Pan. 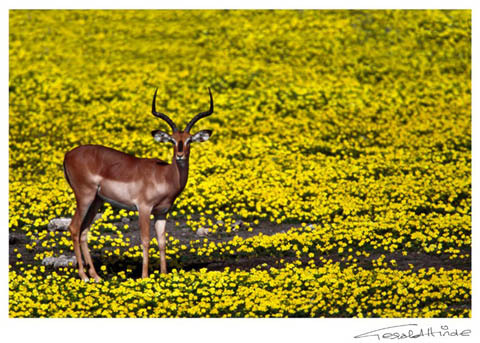 Do you still visit Etosha and do you have any favorite photographic spots there? 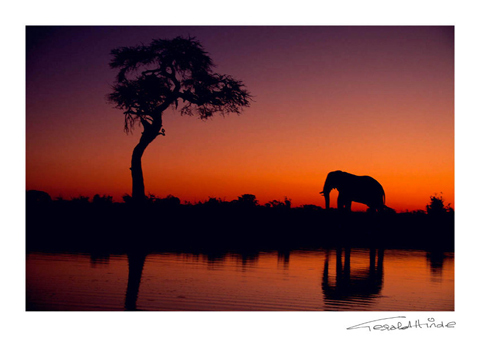 I really enjoy Etosha and try and get there at least once a year. November is my favorite time as one has a good chance of getting those wonderful thunderstorm skies with a bit of late evening sunlight. 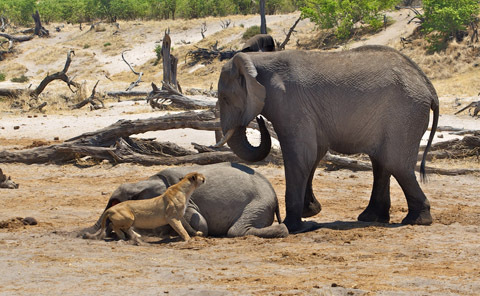 I like the Eastern section of Etosha. 7. In the dedication in all your books you quote from the Bible, specifically Psalm 24:1, Matthew 22:37-40 and Genesis 2:15. That is most refreshing in today's age as so many people worship the creation instead of the creator. Isaiah 55:11 tells us that God's word shall never return to Him void but shall accomplish His purpose - either the hearer's heart will soften or it will harden. Have you had any readers commenting in response to these dedications? Yes mostly good comments. However this is my faith and belief and I don’t mind stating it openly. All our talents are a gift from God. 8. The professional photography market seems to be moving away from image and book sales to photographic workshops, video and e-Books. Have you found this to be so with your business? It seems that books are not as popular as they used to be but surely there will always be room for a good coffee table book- on the table or on the bookshelf. I hope technology will not rob us of this option. 9. Some photographers see Photoshop as a necessary evil and they would much rather be out shooting in the field than editing while others love post processing their images. How do you feel about the digital darkroom? The old style of wildlife photography has mostly been done and without Photoshop or some other technology one could be left behind. But sure, I do prefer to be out in the field. 10. Photo equipment is important but some photographers are obsessed with having the latest body or lens. The camera manufacturers are partly to blame as their advertising says, 'if your photographs are just average then this new piece of equipment will change all that!' 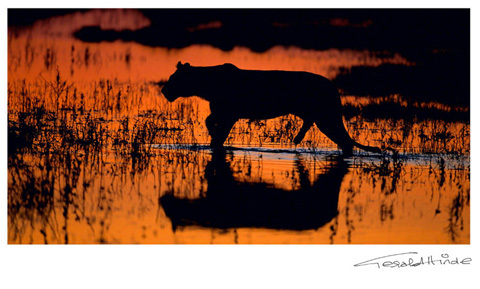 Where do you think a person wanting to improve their wildlife photography should focus their time, effort and money? No doubt that the latest equipment is really great to have – and improves the images one gets – but very few can afford to upgrade all the time. When you buy it is a good idea to buy the best you can afford. Lenses are very important and wildlife photography demands a variety of lenses to optimize your chances. 11. Any new books or projects coming up that you would like to mention? One or two tricks up my sleeve – do not want to mention as yet but please do keep a watch on my blog for updates! In the meantime fine art prints are my focus. 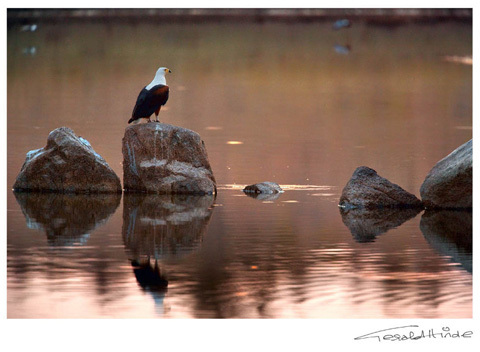 I offer a variety of fine art prints for sale on my website. Gerald Hinde spent 30 years as the director of a large family business before leaving his business cares behind in 1989 and taking up a new career in the African bush. 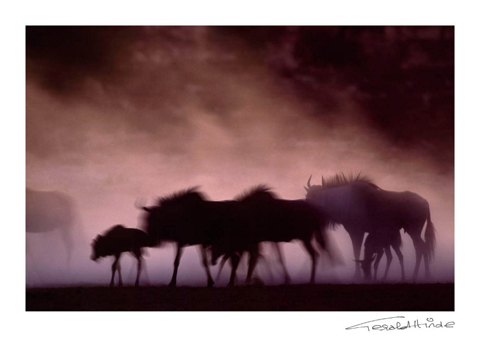 He has won a string of photographic awards in competitions, including the BBC Wildlife Photographer of the Year Competition, Agfa Wildlife Awards (overall winner, 2000), UN Environment Program International Wildlife Photographic Competition and the Fuji Profoto Awards. 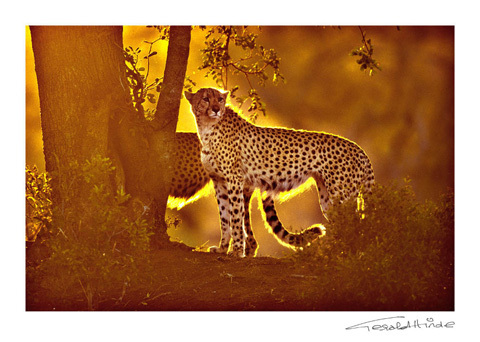 His photographs appear in Gamedrive, Leopard, An African Experience and Africa's Big Five, Images from a Timeless Wilderness, Catching the Moment and Cats of Africa. His work has been published widely in national and international magazines, and on calendars and postcards.